Any compilation record fulfills two purposes: it provides a listening experience, and it makes an argument. At some basic level, the first is, as with any music, the most important, but it's the second that makes for the livelier discussion. 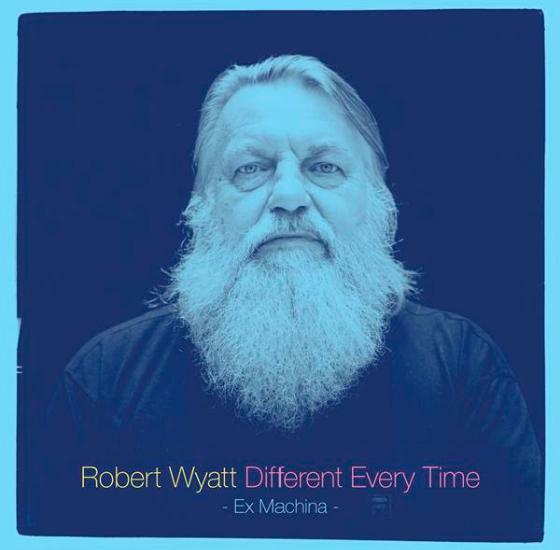 Domino's Robert Wyatt anthology, entitled Different Every Time and split into two double-records, slaughters its opposition as a listening experience. As an argument about the substance of (rarefied language is in this case entirely appropriate) one of the genuinely great, if cruelly under-known, musicians of the past fifty years, there is a counter-argument to be made. In a more just musical world Robert Wyatt would need no introduction, but in ours he does. He first garnered notice as drummer for the Soft Machine, the most legitimately jazz-inspired English rock band of its day, sharing stages with among others Jimi Hendrix and Syd Barrett's Pink Floyd. A brief participation in Matching Mole, a band focused on his own material, preceded a fall, in 1973, three stories to the ground, leaving Wyatt paralysed from the waist down. A recuperating Wyatt determined to press forward and the event, by his own account, provided a catalyst both for personal maturity and a deepening of his approach to music. He released what he considers his first proper solo album, Rock Bottom, in 1974 and followed with releases of his own music every five or ten years until 2007's Comicopera, which he at this point intends to be his last solo record. Throughout his career Wyatt has collaborated with other musicians extensively, and he continues to do so until this day, though at a slower pace than past years. Two double-records: a first, subtitled Ex Machina consisting of his solo work proper as well as that of Soft Machine and Matching Mole arranged chronologically, and a second, Benign Dictatorships, consisting of collaborations, not chronologically ordered. The divide almost instructs a listener to see the first as the main act and the second as a sideshow. To do so would be a mistake: Wyatt's entirely idiosyncratic musical personality is the defining feature across all eight sides. What of this musical personality? Immediately, on Soft Machine's side-long 'Moon In June', which begins Ex Machina, Wyatt presents himself, seemingly fully-formed. High tenor vocals and phrasing drawn from Miles Davis suffuse more or less all of the music with an underlying sense of melancholy, which is somehow uplifting. Wyatt, throughout, is unafraid of colour tones and, almost unique among "rock" musicians, chromaticism. His drumming, both before and after his accident, swings, like any proper jazz drummer, both lightly and hard. 'Beware', included here, is as powerful a case-in-point of Wyatt's swing as can be imagined. It's this quality of swing in Wyatt's music that some have mistaken for a rough-hewn quality in, particularly, his solo work. On the contrary, Wyatt is an accomplished technician, but one who never lets his technique overwhelm the feeling that the music was created by a human being rather than a machine. That human quality, felt in his swing, his melodicism, and his phrasing, lends a remarkable consistency to his work. All of it, clearly, is the effort of the same human being and both halves of Different Every Time teach this. It would be this consistency in Wyatt's output that poses a counter-argument to Different Every Time as it is actually arranged. Taken as listening experiences, both Ex Machina and Benign Dictatorships work beautifully, the first unimpeachably well and the second nearly so. These are records that pass the test of spinning on a turntable without provoking the slightest urge to lift the needle. As an argument about what Wyatt has done, though, Different Every Time's separation of his work into solo and collaborative categories masks the fundamental consistency in his work. His collaborative efforts sound like Wyatt tunes, even if all he did in a particular piece, as in the justly famous 'Shipbuilding', is show up and sing. This is true even of 'Experiences No. 2', the John Cage piece which closes Benign Dictatorships The standards of rock auteurship, which prizes writing over interpretation, do not rightly apply to Wyatt. He needs to be seen through the lens of the Jazz which, he will tell you himself at any opportunity, formed him. The Gershwins wrote 'I Loves You, Porgy', but it was a Nina Simone tune when she sang it. So too with Wyatt and any of these collaborations. It's not clear we can best understand his work by separating it into categories, in this case solo and collaboration, or by implying a linear development, as in the chronological arrangement of Ex Machina. It would be interesting at least and one suspects more enlightening to approach these pieces in a differing order, collaborations interspersed with solo pieces, and the solo pieces not in chronological order. Surely such an arrangement would provoke another series of counter-arguments, but what would emerge is a Wyatt who, like Monk, first appeared on record sounding precisely like himself and nobody else, and who kept that sound intact over the course of decades. At some basic level, though, debating the argument of a compilation record is of secondary importance. If upon listening it gives a palpable sense of whom we are listening to, it succeeds. Different Every Time does that admirably. Wyatt has sustained and continues to sustain himself with quality, idiosyncrasy, and integrity over so long a time, as these eight sides so amply demonstrate.